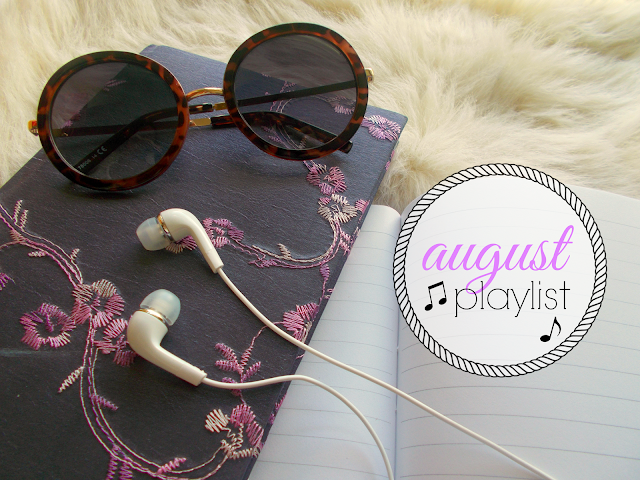 I've got my August Playlist for you today! That is, all of the songs I've been loving listening to this month. I'll just let you know first off that it's a bit of a unique mix! Maven Fiction are an up and coming English indie pop band who I came across through the power of social media! I heard this version of their song Can I Keep You and loved it immediately. I can tell they have a really promising future ahead of them so definitely get involved with them now so you can say you loved them before they hit the big time! I recommend following them on Twitter and sure why not give them a wee like on Facebook! Next up is Foxes! I loved all of the singles she released from her debut album, Glorious but have to say I wasn't really enthused by the other tracks on it. Don't get me wrong, they're good but they just didn't make an impression on me if you know what I mean! Fast forward to the present day and I'm eagerly awaiting her next album because the first single Body Talk has me so excited! I love both the sound and feel of it - it's got all the strength of a good pop song but also has that little extra something that sets it apart from everything else in the charts. Now this is a first, a One Direction song in my monthly playlist! It's not that I have against the band - I actually loved them when they were on The X Factor but after that I just lost interest. I kinda started to regain that interest when they brought out Steal My Girl and now I properly love Drag Me Down, it's such a tune! What a shame they decided to take a break just as I start to like them again! Definitely give it a listen and see what you think even if you put yourself in the 'not a fan' category. I've included two absolute classics by Salt n Pepa, aka hip hop royalty! Shoop and None Of Your Business are two of my favourite songs of theirs and I don't know why but I just haven't been able to get them out of my head recently! Their rhymes are superior and sassy as heck. This is my kind of feelgood music! And finally, the ethereal beauty that is FKA twigs! I've loved pretty much everything I've heard from her so far but I still need a bit of time for her new release M3LL155X to grow on me. Figure 8 is the one that stood out to me first from it - there really is no one else like her musically but I kinda hear Kate Bush vibes from her at times! So there you have it, those have been the songs I've loved this month! Get involved in the comments below and let me know what you think!